Artist's impression of the new Scenic Gem. The new year is all good news for river cruising. Holidays afloat are undergoing an incredible boom: the number of river-cruise passengers has increased three- fold since 2007, according to Cruise Line International Association. And in response to this extraordinary growth, a veritable armada of new ships sails Europe’s rivers in 2014. Leading the invasion is Viking, which set a world record this year when it simultaneously launched 10 new ships. The world’s biggest river-cruise company unveils another 14 over the course of 2014 with a collective capacity for about 2,660 passengers, and bringing to 30 the number of new ships introduced over a three-year period. Scenic adds Scenic Gem on the Seine and Scenic Jade on the Rhine, Main and Danube rivers, and is spending $10 million refurbishing existing ships, on top of its $90 million on new ones. Its value-oriented subsidiary Emerald Waterways also starts operations in 2014 with two ships. A stateroom on Uniworld's new ship Catherine. Meanwhile, Tauck will unveil Inspire and Savor and has renovated Swiss Emerald, which operates on France’s Saône and Rhône rivers. 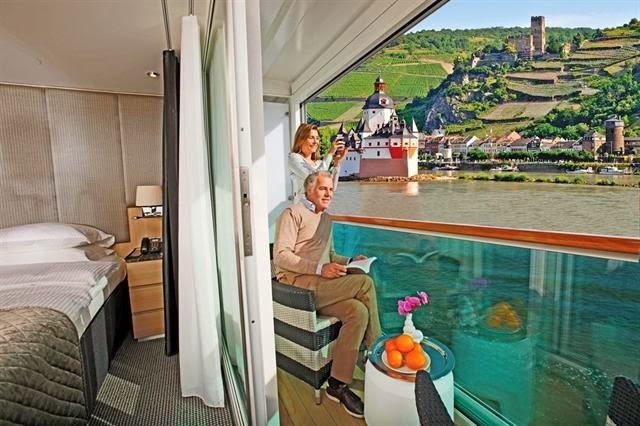 AmaWaterways (APT) floats the new AmaSonata and AmaReina on the Rhine and Danube, bringing its fleet to 15. And Avalon Waterways adds three new vessels – Avalon Impression, Avalon Poetry II and Avalon Illumination – for a total of 13 European ships operating 26 different itineraries. Last but far from least, Uniworld Boutique River Cruise Collection is launching the Catherine on Burgundy and Provence cruises. Carrying only 159 passengers, it will nonetheless be the largest of the company’s deluxe ships, and boasts a heated swimming pool, al fresco dining area and art-filled interior. Stay tuned: we’ll be posting about new ships beyond Europe, and new river-cruise itineraries for 2014, very shortly. Have we missed a new ship in Europe? If so, why not leave a comment and let us know. Our readers appreciate your feedback, and we strive to be up-to-date and accurate. "Anonymous" sorry for overlooking your query. Captain Rivers should have been more on top of this but wa distracted by a lot of travel recently. You are right that Travelmarvel has launched the two new ships you mention, plus another one, MS Excellence Rhône. Seems there are so many new ships floating about that it is hard to keep up! We send more people on Cruise Line Employment than any other company in America, and our website features the Internet's largest collection of customer reviews.